We are excited to announce: TestBash is returning to Munich in 2018! The software testing conference will take place on Friday 14th September 2018, in the “Münchner Künstlerhaus am Lenbachplatz”. After some unforgettable learning & mingling moments we shared in 2017, we figured: why not do it again?! 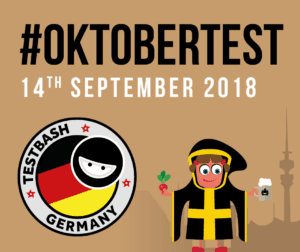 Just as last time, we are bringing inspiring speakers, high-quality content, friendly and cheerful community and a Bavarian spirit to TestBash Munich. But be ready for surprises: we are preparing a bunch of interesting activities to keep you thrilled throughout the whole event. The motto we are following again is: helping testers and people interested in testing learn, grow, network, get engaged and rock their testing endeavours! ASQF-members get a discount of 50,- Euro!